Many reports of Opisthoteutis agassizii from the eastern Altlantic exist. Recently many of these have been shown to belong to a separate species, Opisthoteuthis calypso (Villanueva, et al., 2002). Figure. Oral view of Opisthoteuthis calypso paratype, mature male, 35 mm ML, from Villanueva, et al., 2002. Arms I in males without increased robustness. Female: Typically 7th sucker largest. Suckers number 47-58 on each arm in adults. Males with two fields of enlarged suckers present; largest sucker diameter of distal field equal or (typically) exceeds that of proximal field. Proximal field with greatly enlarged suckers only on arms III, other arms with slightly enlarged suckers of which suckers of arms IV are most enlarged. Number of enlarged suckers 2-6 (usually 4) that lie within sucker positions 4-9 with largest usually sucker 7. Distal field with greatly enlarged suckers on all arms but sligtly larger on arms III and IV. Number of enlarged suckers 2-3 (rarely 4) that lie within sucker positions 23-29 with largest usually sucker 26. Single web nodule on ventral margin of all arms; arises opposite sucker 24-27 (males) or 22-23 (females). Cirri short; maximum length 5 mm in largest octopods. First cirrus appears between suckers 1 and 4 but usually between 1 and 2. More details of the description of Opisthoteuthis calypso can be found here. 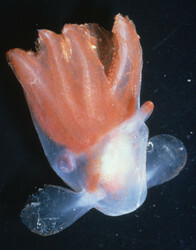 Opisthoteuthis calypso differs from all members of the genus (where males are known) in having greatly enlarged proximal field suckers only on arms III. Figure. Opisthoteuthis calypso. Aboral view of a mature female 75 mm ML and 156 g TW, measured and photographed after thawing. Note the distinct contrast between the digestive system (brown colour) and the ovary (yellow). Collected at 451 m depth, off Namibian waters, SE Atlantic. From Villanueva et al. 2002. Figure. Opisthoteuthis calypso. Oral view of a mature male 61 mm ML, 235 g TW, measured and photographed after thawing. Note the distal enlarged suckers near the web margin on the arms III and IV. Collected at 451 m depth, off Namibian waters, SE Atlantic. From Villanueva et al. 2002. Figure. 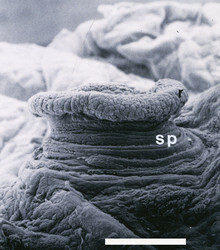 Unmodified suckers of Opisthoteuthis calypso observed under scanning electron microscopy. 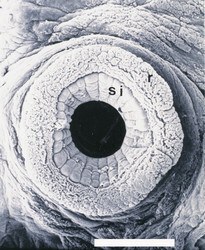 r, rim; si, sucker infundibulum; sp, sucker peduncle. Scale, 0.75 mm. From Villanueva and Guerra 1991, modified. Males reach a larger size than females (Males: total length to 482 mm, weight to 5400 g. Females: total length to 342 mm, weight to 1650 g). Mature males with 15-103 (ave. 42) spermatophores in reproductive tract. Oviducal eggs range from 5.1 to 7.5 mm. Analysis of the ovarian oocyte size frequency is consisten with continuous egg production and release. Reproductive characters suggest that a single, extended and continuous period of egg maturation and spawning exist in O. calypso, as suspected for most cirrate octopods (Villanueva 1992). Prey items of O. calypso include small-sized organisms with low swimming speeds. Benthic gammarid amphipods and polychaetes belonging to the epibenthic and suprabenthic fauna comprise the most important preys. Densities of O. calypso has been estimated in 6-23 individuals km-2 at depths ranging from 483-490 m in SE Atlantic (Villanueva and Guerra 1991). Figure. 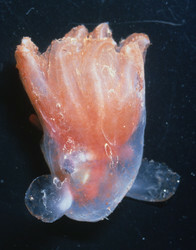 Opisthoteuthis calypso. Juvenile unsexed specimen from ventral (left) and dorsal (right) views. Note the proportionally large fins and funnel in comparison with adult individuals, indicating that fin swiming is more important in early life stages. Specimen photographied on board after collection. Measurements after preservation in formalin and alcohol were 6 mm ML and 19 mm TL. Collected by bottom trawl, NW Mediterranean Sea, 40°54’N, 02° 05’E, 1200 m depth, during the Retro IV cruise. Modified from Collins & Villanueva (2006). Photo courtesy of LLuis Dantart. Type locality: 43°35'N, 02°16'W, Cantabric Sea, Bay of Biscay. Distribution: Eastern Atlantic Ocean and Mediterranean Sea (Villanueva et al., 2002). This species typically occurs on muddy bottoms at depths from 365 m (S.E. Atlantic) to 2208 m (Mediterranean Sea). Collins, M.A. and Villanueva R. 2006. Taxonomy, ecology and behaviour of the cirrate octopods. Oceanography and Marine Biology: An Annual Review, 44: 277-322. Villanueva, R. and A. Guerra. 1991. 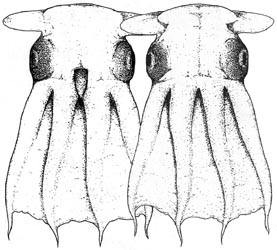 Food and prey detection in two deep-sea cephalopods: Opisthoteuthis agassizii and O. vossi (Octopoda: Cirrata). Bulletin of Marine Science, 49: 288-299. Villanueva, R. 1992. Continuous spawning in the cirrate octopods Opisthoteuthis agassizii and O.vossi: features of sexual maturation defining a reproductive strategy in cephalopods. Marine Biology, 114: 265-275. Villanueva, R., Collins, M.A., Sanchez, P. and N. Voss. 2002. Systematics, distribution and biology of the cirrate octopods of the genus Opisthoteuthis (Mollusca, Cephalopoda) in the Atlantic Ocean, with description of two new species. Bulletin of Marine Science 71(2):933-985. Drawings from Villanueva, et al. (2002) printed with the Permission of the Bulletin of Marine Science.